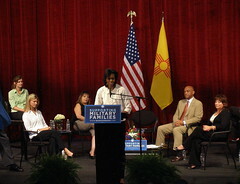 My story on Michelle Obama's visit to Santa Fe Thursday -- and retired Major General Melvyn Montano's remarks about why John McCain supports the war in Iraq - can be found HERE. And I just realized I never posted a week to my color piece about Barack Obama's acceptance speech at Mile High Stadium a week ago . For the record, that's HERE.